I know I've said it before - Dance is magic. Theater is magic. If you've never felt that feeling - that electric feeling - then I truly feel sorry for you. It is a feeling like no other that I have ever experienced. Nothing can compare to that natural high, that freedom you feel. Even a chemically induced high is just not the same. I was lucky enough to see Billy Elliot the Musical this past weekend. There were many wonderful things about that show - I could do a whole post just on that. But I'm not going to go into the impressive transitions, the kids, the story, the symbolism of the choreography, or the general choreography of the whole show (the workings of the show was like a ballet itself!). But I do have to talk about the Swan Lake scene where Billy is dancing with his older self. What a beautiful moment for live theater! The hair on both my arms stood on end the entire scene. I'm not even sure if I breathed until it was over. There was electricity in the whole room. I could hear and feel the reactions of the audience. I could feel the presence of the actors. But at the same time, everything was blocked out as I was transported into this dream world of Billy as he was able, for just those few minutes, to be free. Everything in his life - literally and figuratively - faded into black and he was just dancing. As he lost himself more and more into the song, his dance literally took off - sending him soaring into the sky - free as the highest bird. 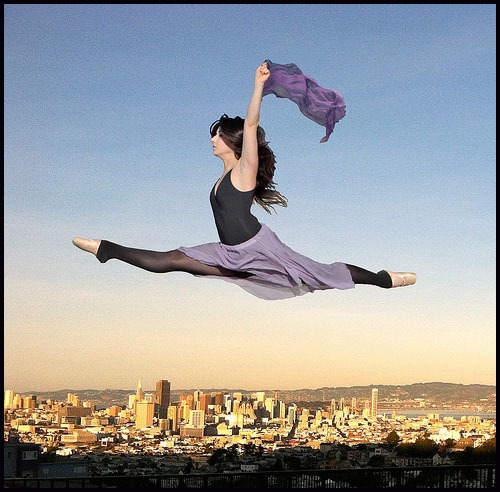 I sat and I watched this thinking - wow, that's exactly what dance, any dance, feels like - like you're flying. Like you're free. Nothing else matters. It's your release. Your escape. Pure freedom. What a wonderful physical representation of a feeling that is so hard to describe. I remember the first time I was able to let go while dancing and first experienced that feeling of flying. It was one of the most exhilarating things I've experienced and a memory I will never forget. I've always believed that dancing is the purest form of communication because you don't have to talk. And that scene in Billy Elliot was a beautiful example of that. And I'm listening, and I'm listening, and then I disappear. And I'm free, I'm free...."
That feeling like you're suddenly flying? I think that's a very simple and precise way of describing the Arts. What a wonderful feeling. What a way to round out not only the human experience but of humanity itself! I can't imagine this world without the Arts. What a sad, boring, and miserable experience it would be. I am sickened every time I hear of yet another Arts venue or program closing. I hate to think that I may someday live in a world where I might not be able to expose my own daughter to these wonderful things. If you've never experienced the power of the Arts - that electricity - try it. You'll never forget it. If you have a chance to support an Arts program or institution, please do. Bring your children. Enroll them in a class or group. It's important that these programs stay around. It's critical that we have a world that allows our children to experience the full range of the human existence (and not just the bubble sheet tests they're subjected to at school - Don't even get me started there).